Ilhaan Jivani quickly pushes several buttons on the Canon camera, showcasing his new found photography knowledge. The Grade 8 Valley Park Middle School student was one of 20 teens taking part in the week-long Fredric Roberts Photography Workshops at the Aga Khan Museum, and when The Mirror stopped by, the budding photographers were busy snapping pictures of people and architecture inside the impressive Wynford Drive building. The workshop, run by award-winning photographer and philanthropist Fredric Roberts, saw 20 students from disadvantaged communities in North York, East York, Scarborough, and Richmond Hill learn a crash course in photography and photojournalism. An exhibit of the students’ work will be displayed during a workshop graduation ceremony at the museum Saturday, March 19, followed by a second exhibit at the nearby Ismaili Centre April 30 to May 31 which will combine curated photos from these students with photographs taken from other Fredric Roberts workshops at Aga Khan locations overseas. The exhibit will be featured in this year’s Scotiabank CONTACT Photography Festival. The 13-year-old’s favourite things to photograph at the museum included architecture and up-close shots of plants. “They look pretty good,” he said, adding he could see photography becoming a hobby but not something to pursue professionally. Fellow Valley Park student Alim Kutchhi admitted it took some time to get used to how the Canon camera worked. “I’m trying to take the best pictures I can,” said the 14-year-old who, like Ilhaan, views photography as a leisure activity. 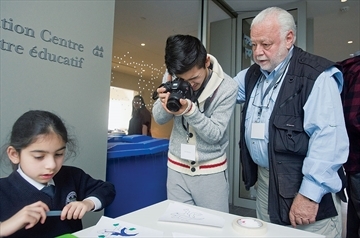 This marked the first time Roberts, a former Wall Street executive, has brought his workshop to Canada, which has been held in various third-world countries such as India, Bhutan, Nicaragua, Kyrgyzstan, and Tajikistan for youth between ages 14 and 16. At the end of each workshop Roberts conducts, a donation of several cameras and editing software is made to the non-governmental organizations that he partners with for the workshops. Los Angeles based Roberts, who founded the Fredric Roberts Photography Workshops in 2011 after retiring from the financial world in 2000, said his teachings are designed as empowerment classes. Roberts, a former Wall Street executive and head of the NASD (which used to own and operate the Nasdaq Stock Market), left investment banking after becoming disillusioned with the greed that appeared to consume those in his field of work. His journey into photography began with a six-week 1986 vacation to China, Tibet, and Thailand, when he didn’t even know how to install the battery into his newly purchased camera. He returned home and showed his photos to some friends, who encouraged Roberts to take a weekend photography course at UCLA run by a pair of National Geographic photographers, who were impressed with his shots. He went home and put his photos in a closet, where they remained for 14 years until his retirement. They were dusted off post-retirement when a friend made a passing remark about them. This time, after attending a workshop in Santa Fe, Roberts decided to focus his energy on his newfound calling – photography. After several years of solo exhibits, the Yale University graduate switched gears to focus on photography workshops with teenagers from third world countries. Jovanna Scorsone, education manager at the Aga Khan Museum, said students are learning to tell stories using the camera as a tool.